If you’re struggling with anxiety, stress, or even panic, you’ve probably already been given the advice or tried to tell yourself to “Just relax”, “Let go”, or “Forget about it”. That advice isn’t wrong, but the real problem isn’t knowing WHAT you should do, it’s knowing HOW to do it! If you knew HOW to let go, relax, and quiet down the negative chatter in your mind when you feel overwhelmed or anxious, you would have by now! You may even feel that your life moves at such a hectic pace and there’s so much on your plate to worry about that you’ve forgotten how to relax! You used to be less anxious and pressured, but now it may just seem impossible for you to be like that anymore. You WANT to relax, you WANT to be less stressed out and anxious all the time, you WANT to be happy again, but no matter what you do or try, you feel like you can’t turn off your frantic mind. To make matters worse, even if you could somehow learn to relax, you may feel like you have NO TIME to sit around cross legged on the floor for hours chanting mantras, doing deep breathing, visualizing, or whatever outdated, boring, and ineffective “relaxation techniques” you may have read about or been told to try. Of course you need to relax, you already know that. The problem is YOU CAN’T. Learn how science, technology, and our understanding of the workings of the human mind is making overcoming your stress and anxiety far easier, faster, and more effective than ever before. Having a calm, quiet, and confident peace of mind isn’t about knowing WHAT to do, it’s about knowing HOW to do it. Even though we just talked about it above, it’s so important it bears repeating. Telling an anxious or stressed out person to “relax” or “take your mind off it” is like telling someone new to playing golf to simply “hit the ball into the hole”. Yes, obviously that’s the ultimate goal, but the advice is completely useless without also teaching them the right strategies and process to use that allows them to do that more easily and consistently! You need to learn HOW to let go, calm your mind, refocus, and relax so you can do it on your own whenever you want to in the future. Drugs or Alcohol are Probably Not the Best Solution For Your Stress or Anxiety. If you need to drink or take pills to calm yourself down or “take the edge off”, is that really the way you want to live your life or just another way of avoiding the REAL problem? Research at the University of Pennsylvania and University of Washington School of Medicine discovered that even some of the most common and widely prescribed anxiety medications can often cause “Rebound Anxiety” which can actually make your symptoms of anxiety worse and more intense! I don’t think you’ll disagree when I say that enduring side effects and risking addiction isn’t a good option when better and safer alternatives are available. You CAN learn to relax, calm your mind, and be less anxious WITHOUT poisoning your body and mind with dangerous and powerful substances. Learning the skills of relaxation doesn’t need to be hard, boring, or take a long time. It’s a COMPLETE MYTH that achieving mental calmness and clarity requires that you spend hours a day sitting on a cushion doing mindless breathing exercises, visualizing your “happy place”, or repeating a silly mantra like “Om”. Maybe that’s one way to relax, but I would certainly never call it the best way. I think anything worth doing is worth doing as quickly and painlessly as possible. I’m not impatient or lazy, but isn’t that what makes sense? If something is worth pursuing or achieving, why WOULDN’T you want it as quickly and easily as possible? What additional benefit is there in suffering longer or delaying your life or happiness MORE than you have already? There’s absolutely no reason whatsoever that learning new skills that can help you be more relaxed, calm, and centered needs to be frustrating or take a long time. You’re probably already stressed out, you don’t need to make learning to relax stressful too! Life is busy and hard enough as it is, you don’t make it harder by trying to squeeze one more overly time consuming, boring, or complicated activity into your already busy life, especially when a quicker and easier solution exists. Don’t “Wonder if it’s Working”. Be Result Orientated! The compounding problem of many outdated relaxation techniques is that because they take so long to begin to be effective it’s incredibly difficult to know if they’re doing you any good at all! It’s common knowledge the traditional meditation can take YEARS if not decades to master. Even monks will shave their heads and sell their possessions, isolate themselves from society up in the mountains, and devote most of their lives to their meditation practice, just to get good at it! Is that strategy going to work in YOUR real life? Do you want to change your life and feel better now or maybe, just maybe, five years from now? How would it feel to come to the end of those five years and realize that the hours you’ve been spending every day sitting cross legged on the floor smelling incense and hoping to be different have all been for nothing? You need to know quickly if what you’re doing is working or wasting your time. You need to stay focused on RESULTS, because in the end, getting results and improving your life is all that matters. Use Technology and Research Driven Science to Dramatically Speed Up and Improve Results. There’s no reason for ANYONE to still only be using Relaxation or Meditation Methods From 2,000 Years Ago! The core of the problem that’s probably keeping you stuck, stressed out, and miserable is that whatever outdated techniques or methods you may be using now to relax and overcome your anxiety drastically need to EVOLVE. Before we get to that though, I want to make sure you understand the science of stress and anxiety and what research has shown about how to live a far more peaceful, positive, and less turbulent life. All day every day, your brain is actually producing a specific electrical frequency that fluctuates and can be measured as a “wave”. It’s not really so different than your heartbeat which can also be measured and produces a similar looking electrical wave or pulse on an EKG. This is basic information known to doctors and neuroscientists, it’s called Neural Oscillation and was first discovered way back in the 1930’s when the first incarnation of the device that allows researchers to measure the brain’s electrical frequencies was invented (we now use similar instruments to monitor brain activity during surgery for instance). Neuroscience has come a long way since then, and we now know significantly about the tremendous impact your brain waves have and what they mean for your life. There are five different brain wave frequency ranges that have been given specific names, Gamma, Beta, Alpha, Theta, and Delta waves. 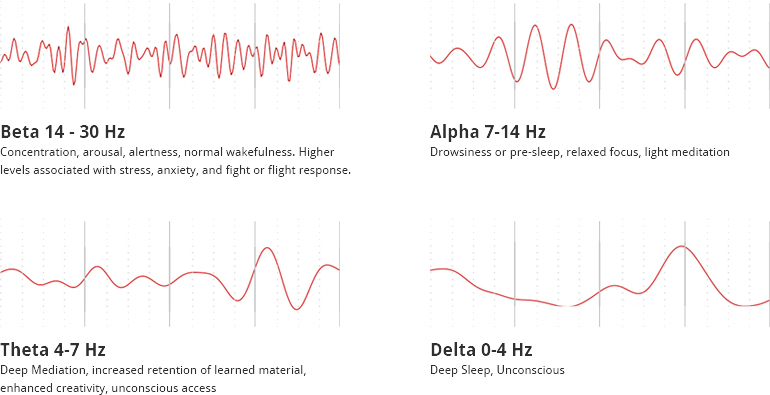 Each of the varying frequency ranges is associated with a different type of brain activity, from intense fear all the way to your deepest sleep. As you can see from the above, when you’re anxious or stressed, your brain is operating at one frequency, and when you’re deeply relaxed and at peace, your brain is at quite another frequency. The bottom line is that your brain wave patterns are very closely correlated to your thoughts, emotions, and overall state of mind. Ideally, you want to avoid the high beta frequencies seen with anxiety and stress and encourage the alpha and theta frequencies that are produced when you’re calm and relaxed. This science may not mean much if you only use outdated ancient techniques to relax and are still crossing your fingers and hoping that with enough practice you’re lucky enough to be able to occasionally relax deeply enough to achieve the state of mind you’re hoping for. However, these facts quickly became VERY IMPORTANT when researchers discovered that instead of trying to relax first and if you’re successful THEN experiencing the benefits of the change in brain wave frequency, we could REVERSE the process and change your brain wave patterns FIRST and then the relaxation would follow automatically and effortlessly! 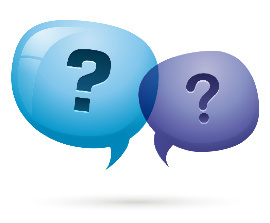 The big question for researchers became HOW to alter the brain wave patterns. What was eventually discovered is that by using sophisticated production equipment, audio tones could be scientifically engineered to oscillate at a specific frequency range such that when listened to, would cause a phenomenon known as “brain wave synchronization” which would literally cause your brain waves to change AUTOMATICALLY to more closely match the frequency of the specially developed audio signal. This advancement led to the development of our NeuroCalm Technology, a proprietary audio engineering process and the foundation for the incredible Auto Calm System. The Auto Calm System was developed by am amazing team of experts and professionals and includes contributions from a licensed physician, an award winning neuropsychological researcher from the Department of Psychiatry at the University of Illinois at Chicago, a Doctor of Clinical Psychology, former Psychology Professor from the University of Miami and researcher at the Cognitive Brain Research Unit University of Helsinki, Finland, audio and sound experts, and more. We developed The Auto Calm System to put the power and potential of these new advancements into the hands of the public by making it convenient and affordable, so EVERYONE can experience the results and live a better life and not just those undergoing university studies or those with the financial means to spend thousands of dollars on state of the art equipment. By incorporating these cutting edge technologies with more traditional relaxation practices such as meditation and mindfulness, you can start to accelerate the incredible benefits of these proven techniques so you can give yourself the edge you need to experience results FASTER and more CONSISTENTLY. anxiety, and FINALLY change your life for the better. During the four years of development we spent on The Auto Calm System, we studied and analyzed mountains of cutting edge scientific research and created dozens of prototypes that led us to create two additional technologies to maximize your results that we incorporated into the final version of the system available today. Our exclusive Medi-Cadence Audio Design (M-CAD) incorporates rhythmic acoustical pulsing into The Auto Calm System which is based on techniques research has shown can not only further aid in the automatic relaxation process, but may even have significant physical benefits as well. We also pioneered the Mind Acoustics audio engineering process which combines BOTH the NeuroCalm and M-CAD technologies together with professionally composed and carefully selected background music and spoken word instructions designed to effortlessly guide you into an amazingly peaceful yet energizing state of relaxation you may have never experienced before, and to do it AUTOMATICALLY at virtually the touch of a button. What really makes The Auto Calm System so powerful, and why it’s gotten so much attention, is this combination of MULTIPLE cutting edge audio technologies and strategies derived from published and peer reviewed research with more traditional practices such as mindfulness meditation to take your relaxation training to the next level. it on your own, whenever you want to. 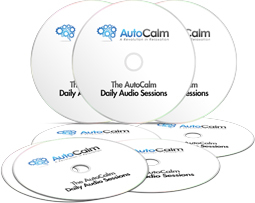 The Auto Calm System is easy and convenient, it was designed to be used on your computer, on your mp3 player like an iPhone or iPad, or you can even put it on a CD, it’s completely up to you. No special or expensive equipment is needed. It was developed to able to be used quickly in your busy life and not take a lot of time you may not have. 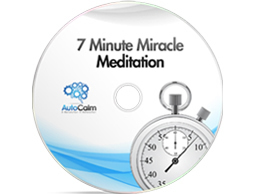 In fact, if you have just SIX MINUTES you have time to start using and benefitting from The Auto Calm System. The focus of the system is on results that LAST. You’ll be guided by the hand through exactly what you need to know and to do to follow the system and experience the results not just while you’re listening to the system audio, but in your LIFE. Anyone can be relaxed when they’re laying down with their eyes closed, but that’s not the point of relaxation training. You need to teach your mind to remain calm even in situations that used to make sure you anxious or even panicked, or when life throws you a curveball. Research has shown that consistent use of the types of practice you’ll be learning and doing in The Auto Calm System can having lasting results by literally changing the way your brain works by a biological process known as “Neuroplasticity”. What neuroplasticity basically means is that your brain can actually change and adapt structurally as a result of repeated input. For instance, if you become anxious in a certain situation or environment, the more often you experience the anxiety in those conditions the more likely it is to continue and become more powerful as your brain creates additional neural pathways related to that fear response. However, you can also REVERSE that process and use it to your advantage by repeated exposure to the type of training you’ll be exposed to in The Auto Calm System. Instead of your brain creating additional neural pathways for negative states and emotions such as fear, you can train your mind to respond with calm and confidence by strengthening and developing new neural pathways associated with positive thoughts and emotions. You can learn to shatter the habitual negative patterns and reactions that may be currently keeping you miserable and stuck! What is Meditation and Mindfulness Exactly? Meditation and mindfulness are so misunderstood because some people make them seem much more complicated than they actually are, or are wrongly associating them with something else entirely that just happens to incorporate meditation as a small part of it. It’s really incredibly simple. Mediation and mindfulness are nothing more than training yourself to pay attention to what you WANT to pay attention to instead of what you don’t want to. They don’t have anything to do with Buddhism or other religions any more than just drinking a glass of wine makes you a Christian. Yes, meditation is something that is a part of some religions, just as drinking wine during a ceremony is something some other religions do, but that in and of itself doesn’t make meditating or drinking wine an inherently religious activity by ANY definition. 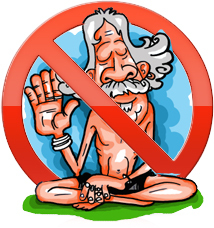 Meditation is not a prayer of any sort, it’s just “thinking on purpose”. Meditating isn’t only for “weird” people, monks, or hippies. You don’t need to sit on a cushion, you don’t need to burn incense, and you don’t need to sit on top of a mountain. The reason techniques like meditation and mindfulness have been around for thousands of years is because they WORK, although by using only traditional practices alone they tend to work very slowly and take a lot of practice They can help you learn to slow your body and mind and refocus your attention to where you want it to be, instead of the negative places your emotions may be currently drawing your attention to. Simply put, it’s learning to control your mind and emotions instead of being controlled BY your mind and emotions. The Auto Calm System is easy, fast, safe, and based on results oriented SCIENCE. The core of the System are the Daily Sessions in easy to use mp3 format which is compatible with all computers, can be imported into your iPod, iPhone, or iPad, or even put on a compact disc . The sessions are organized by week, for eight weeks total. Each week contains five sessions for a total of 40 individual tracks. The Quick Start Guide will show you everything you need to know to get started with The Auto Calm System in under 15 minutes. If you want to learn more about the research and science behind the material, or get additional information and advice for overcoming your anxiety, you have a comprehensive and detailed manual at your disposal that was developed with contributions from a licensed physician, neuropsychologist, Doctor of Clinical Psychology, neuropsychological researcher, and more. The Quick Start Guide and Manual are delivered in convenient PDF format. This series of audios are absolutely amazing for anyone that struggles with anxiety, fear, or even panic attacks. The Anxiety Evolution Audio Series is four individual sessions totaling over an hour of advanced guided imagery and visualization training developed to help you shatter your anxious thought patterns and behaviors and replace them with new automatic responses of courage and belief in yourself. These sessions are NOT enhanced with any brain entrainment technology, so they can be enjoyed with or without headphones. This powerful audio session is designed to guide you into a state of calm confidence very quickly and effectively. It’s a wonderful way to take a brief time out during your day to relax and recharge, or if you find your stress or anxiety levels building. Use it wherever and whenever you want…during a break from work, while running errands, when traveling…you can always find 7 minutes to bring yourself back to the present moment and break your old patterns of anxiety! 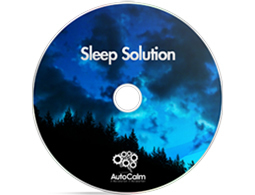 Sometimes the concerns of the day can make getting a good night’s sleep a challenge, and if that’s something you can relate to, you’re going to LOVE The Auto Calm Sleep Solution Audio Session! This 20 minute track contains no spoken words at all, so you can just let yourself go and allow the soothing audio and Neuo-Calm technology to carry you away into a deep and restful sleep. The Sleep Solution audio is configured with a variable frequency that slowly slows all the way down to Delta (deep sleep). Sometimes you need to become more alert and focused rather than relaxed, and the Mind Spark Collection has been engineered to help you do exactly that, without making you MORE stressed! The collection includes three audio sessions totaling over TWO HOURS to be used whenever you need to clear your head, focus, and enhance your concentration. These sessions include no spoken word that may distract you from what you need to accomplish, just a wonderfully energizing yet relaxing background track from our Mind Acoustics library masterfully combined with a higher frequency Neuro-Calm signal. Listening to the Mind Spark sessions has been described as being like “coffee without the jitters”! You’ll also have the option to include the complete Auto Calm Kids Edition with your order absolutely free! Anxiety in children is becoming alarmingly common, and often parents just don’t know what to do to help. To provide a resource for parents to turn to for assistance, we developed a special edition of The Auto Calm System designed for use with children ages 3-15 that you will have the option of accessing with the rest of your system components absolutely free! The Kids Edition of the Auto Calm System contains the exact same benefits and technologies as the original Auto Calm System, and was developed based upon the analysis of the results of the same published research and science. Your child can use the Kids Edition of the Auto Calm System to be guided into a state of deep relaxation, security, and confidence, and just as in the original System, and can get started with only a few minutes a day. With time, practice, and maybe a little help from mom or dad, they can acquire the same important skills that they can use on their own to help themselves better cope with life’s challenges and reduce their anxiety so they can experience the childhood and life they deserve. 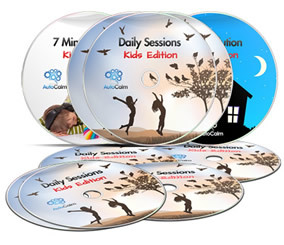 The Kids Edition of The Auto Calm System contains daily audio sessions that have been specially tailored for children, along with the 7 Minute Meditation Session and a bonus session, everything engineered just for kids! The entire Auto Calm Kids Edition will be available for you to include after purchase at no additional cost with your order. The system was designed from day one to be simple. You don’t need to know any difficult or painful postures or positions, and you don’t need to light any candles, the technology utilized in The Auto Calm System doesn’t require any of that! Just sit or lie down someplace comfortable where you can get away for a few moments relatively undisturbed. The system is 8 weeks in length, and you’ll be using one audio track every day during the week, Monday through Friday. You won’t need to use the system on the weekends, and every track is clearly labeled and organized so it’s easy to know exactly what you need to do each day. You can use the System in a way that works in your life with your schedule. If you want to use it in the morning, that’s fine. If you want to use it before bed, that’s fine too, as is during your lunch break or whenever you can find a few extra minutes in your day. The System starts small and gradually builds in length, and you can decide how much practice you need and can realistically fit into your day. You’re supposed to ENJOY your time with The Auto Calm System, so the last thing we want is for it to cause any additional stress! The sessions are as short as six minutes, the longest is only thirty minutes in duration, and there’s everything in between. If you want to spend more time with the System because you enjoy the peaceful feelings of relaxation and calm so much, you can use the longer sessions more often. If you prefer to stick with the shorter sessions, that’s fine too. You can even do shorter sessions on busy days and longer ones when you have more time. Again, it’s completely up to you, the system in highly customizable. You don’t need any special equipment or qualifications to use the system, all the tracks are in easy mp3 format which is compatible with all computers, can be imported into your iPod, iPhone, or iPad, or even put on a compact disc. The system manual is in Adobe PDF format which is also compatible with both Mac and PC and doesn’t require you to purchase any special software. The system also comes with the additional components outlined above, but they are completely optional, so you can feel free to use them if you have some extra time and want to, or when you’ve completed the 8 weeks of the core system, but if you don’t want to use them at all it’s perfectly fine too and won’t effect the results of the primary system components. Who is The Auto Calm System for and more importantly, who is it NOT for? Maybe you already knew a lot of what you’ve been reading, or perhaps you find this information about how your mind and anxiety work entirely new or even somewhat hard to believe. Although it’s understandable to have that initial reaction, like anything else based on actual science and evidence, the reality is that it really doesn’t matter because the results you can experience have nothing AT ALL to do with belief. 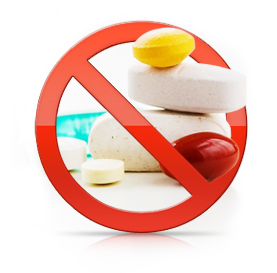 If something only works if you believe it will, that’s NOT science, that’s called the placebo effect. It means that in reality, it probably doesn’t work. That’s what separates REAL science from new age make believe hocus-pocus. Just like you experience the effects of gravity whether or not you believe in it or understand it, the published research The Auto Calm System was based on doesn’t require you to have belief for you to reap its results. Additionally, The Auto Calm System has been developed to be as easy and fast as possible, but it WILL require some degree of time and effort for you to be successful. Granted, you only need to find six minutes in your day to get started, but some people find even this relatively minimal time commitment more than they are willing to invest in themselves. If you realistically think that you’re simply not going to be able to find those extra minutes in your day at this point in your life, we suggest waiting to begin the System until you are able to do so in a way that enables you to use it successfully. Lastly, you may be someone who thinks it would be NICE to be a little more relaxed sometimes, but overall, you think you’re doing a good job managing your stress. Maybe your personality makes you generally pretty calm and laid back, and although you have bad days and experience situations in life that stress you out like everyone else, you wouldn’t go so far as to describe yourself as anxious or a “worrier” and you’re wondering if this System is right for you. The Auto Calm System was NOT designed for individuals that simply WANT to relax, but for those that NEED TO change. If learning to slow down your mind and handle your stress and anxiety differently is still something you consider optional instead of required for your life to improve, The Auto Calm System may be more than you need. However, if you’ve tried everything else and desperately need to change how your mind reacts and responds to stress, I think you’re in the right place. By this point, you understand why the outdated methods you’ve been trying to use to relax and conquer anxiety hasn’t worked and may even be making you worse, and how breakthroughs in scientific research is shedding new light on how you can lead a completely different and better life by altering the way your mind and body typically responds and reacts. You know the critical role your brain frequencies play in your emotions and experience of life, and how the technologies and strategies like those used in The Auto Calm System can make improving your life radically easier by making relaxation virtually automatic. You’ve read about the research behind the development of our three proprietary technologies, NeuroCalm, Medi-Cadence Audio Design, and Mind Acoustics and understand that the power of The Auto Calm System is from the synergy of their combination which takes traditional meditative practices to an entirely new level, light years beyond what you may have ever experienced. Exactly what you will receive in the system and precisely how to use it has been described in detail. You’ve seen it takes a only small investment in time, isn’t complicated or difficult, and isn’t another “New Age” gimmick. Maybe you’re wondering if being able to relax, calm your mind, and refocus will really be worth the money and effort. Ultimately, only you can answer what the impact of being able to relax more often, easily, and quickly would have on your life. 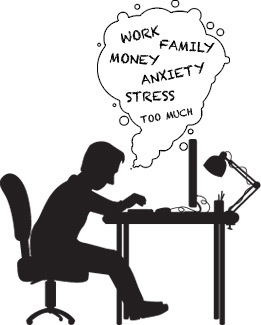 What would you be able to do if your weren’t anxious, stressed, or overwhelmed with life? How would it feel to be more at ease, confident, and comfortable inside your own body and mind? How would your life be different today if you had this opportunity a year ago or FIVE years ago? What will your life look like a year from now if things DON’T change? (*hint*, the answer is probably pretty much the way it does now). I suppose it’s possible that despite the mountains of published peer-reviewed research by multiple experts around the world, you still aren’t convinced these advanced strategies and technologies will work for YOU. I can understand how you feel, but I’m not going to let that get in the way of you changing your life for the better. I won’t allow you to struggle needlessly just because it wasn’t easy enough to get started with The Auto Calm System. fastest, and easiest way to learn to relax AUTOMATICALLY available. We’re so confident in the outstanding quality and results of The Auto Calm System that you can evaluate it risk-free for a full 60 days. If at any time you can honestly tell me the results you’re experiencing aren’t far better than you ever expected…if you’re not completely blown away with how much better your life has become with your new ability to relax and stay calm and focused when you used to be overwhelmed or anxious, let me know and I’ll give you a 100% full refund with no questions asked and no hard feelings. If you follow the program, it will work for YOU or you won’t pay a single dime. I know you may have already tried other things to relax, overcome your anxiety, or have a better life. Let me be clear, The Auto Calm System isn’t some sort of a “miracle cure” and I think it would unethical to present it as such. It’s going to take some effort and dedication on your part too and because of that there’s no way I can predict with absolute certainty what your individual results will be. That’s why I’m going to let you use the WHOLE system, take plenty of time to try it out in your life, and make up your own mind, on your terms. That’s more than a guarantee – that’s a personal promise. Once you order, you’ll be able to get started quickly with our INSTANT DELIVERY. No waiting or shipping fees! CD’s are virtually obsolete. Why wait for The Auto Calm System to be delivered via snail mail when you can have access instantly? We offer immediate and secure digital delivery, so you can download the entire Auto Calm System straight to your computer and listen to it wherever you are or copy it to your iPod or other mp3 player to take it with you wherever you need it. As soon as you place your order, you’ll be taken to the private download area where you can instantly download the material to any computer you like in convenient mp3 and PDF format. You don’t need to be a computer whiz because it’s super simple, stress-free, and fast. The system will work with any computer, there’s no special software you need to buy, and all you need to know how to do is click a link. If you ever need any help, don’t worry, we’ll be happy to assist you. The Auto Calm System was developed with contributions from an amazing team of doctors, neuropsychologists, researchers, and other professionals. The System utilizes our proprietary NeuroCalm Technology, Medi-Cadence Audio Design, and Mind Acoustics process you won’t find anywhere else to maximize and accelerate your results. The system is backed by a no questions asked, no hassles, 100% Money Back Guarantee for a full 60 days so you have plenty of time to use the ENTIRE system before making a final decision. The development of The Auto Calm System was based on hundreds of published and peer reviewed scientific studies performed by university researchers, physicians, psychologists, neuroscientists, audio engineers, and more. If you have just six minutes to spare in your day, you can get started with The Auto Calm System. It was designed to be fast, easy, and convenient, so it can work with YOUR schedule and YOUR life. Brain wave synchronization can make your relaxation experience virtually AUTOMATIC with a touch of a button, without any special equipment or software. You won’t have to figure out anything…you’ll be guided through EXACTLY what to do every day in your audio session, just press play and you’re done! 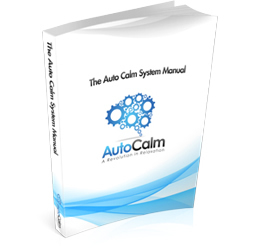 The Auto Calm System is incredibly affordable so you can get started right away. 100% Money Back Guarantee – I understand that my satisfaction is completely guaranteed. If I’m not absolutely THRILLED with the results of The Auto Calm System, I have a full 60 days to take advantage of the no questions asked, no hassles guarantee and get a complete refund of every penny I paid. Receive The Complete System – I understand that I’ll be receiving the COMPLETE Auto Calm System, which includes everything outlined above…The Auto Calm System Manual, the full 8 weeks of audio sessions, the exclusive 7 Minute Meditation track, the Anxiety Evolution Audio Series, Sleep Solution audio, Mind Spark Collection, and full Kids Edition in easy to use PDF and mp3 format so I can download them right away and get started fast. Developed With Doctors and Professionals – You can trust in The Auto Calm System because it was developed with contributions from award-winning doctors and professionals. Exclusive Proprietary Technologies – The system was developed using our proprietary NeuroCalm Technology, Medi-Cadence Audio Design, and Mind Acoustics you won’t find anywhere else to maximize your results. The Auto Calm System truly is the next generation of relaxation designed to work conveniently, easily, and quickly in your real life. All completely guaranteed and only a single secure payment of just $97! P.S. – Every day you wait to get started with The Auto Calm System is another day you may be NEEDLESSLY suffering with stress and anxiety. Your satisfaction is guaranteed – so what are you waiting for? Click Here to Order the Fully Guaranteed Auto Calm System Now!